The Suisun Resource Conservation District works with the landowners to provide assistance and guidance on numerous areas of club management. Attached files are useful information and documents for landowners during different times in the Marsh. 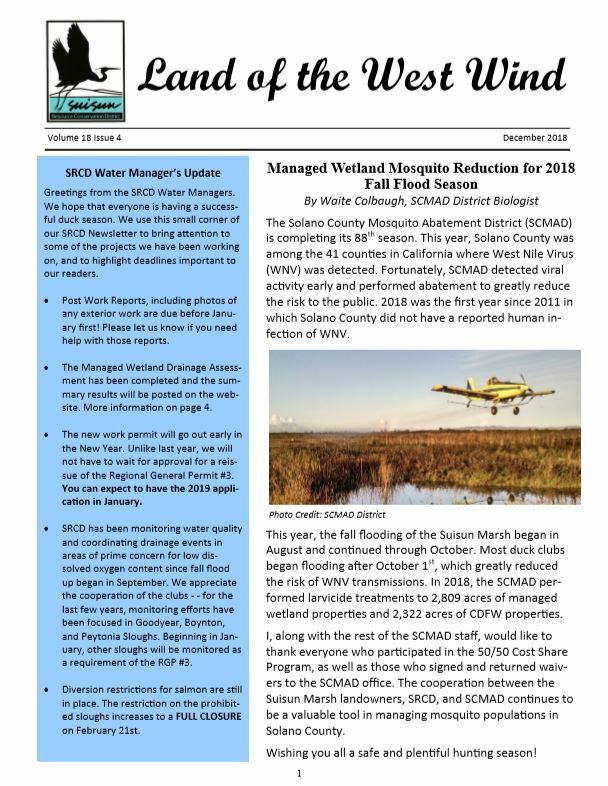 Please review and if you have any questions or comments, contact SRCD or the Water Managers. For clubs that submitted statements in 2010, you are required to record monthly water diversions for the 2013, 2014, and 2015 calendar years. A supplemental measurement form is required for submission on or before July 1, 2016. A PDF version of the Diversion reporting form is listed below. The submission for the July 2016 forms will be done through an online version with a username and password linked to each diversion you reported an Initial Statement on. Contact your Water Manager for any assistance you may need and do so as soon as you can due to the tedious processing of the online forms. Please see link below for further instructions. On June 24 2015, Governor Brown signed Senate Bill 88 into law. This legislation added new measurement and additional reporting requirements (effective as early as January 1, 2016) for a substantial number of diverters who divert more than 10 acre-feet of water per year, including the Suisun Marsh. The State Water Resources Control Board adopted Emergency Regulations to implement these new provisions of the law on January 19, 2016. This new law and regulations affects all water users required to file a Statement of Diversion and Use in the Suisun Marsh, including those claiming riparian or pre-1914 appropriative water rights. Reporting of water diversion amounts is now required annually and the past reporting requirement of every three years has been eliminated. As a result, all landowners had to report their 2015 diversion amounts and any past years not previously reported by July 1, 2016. 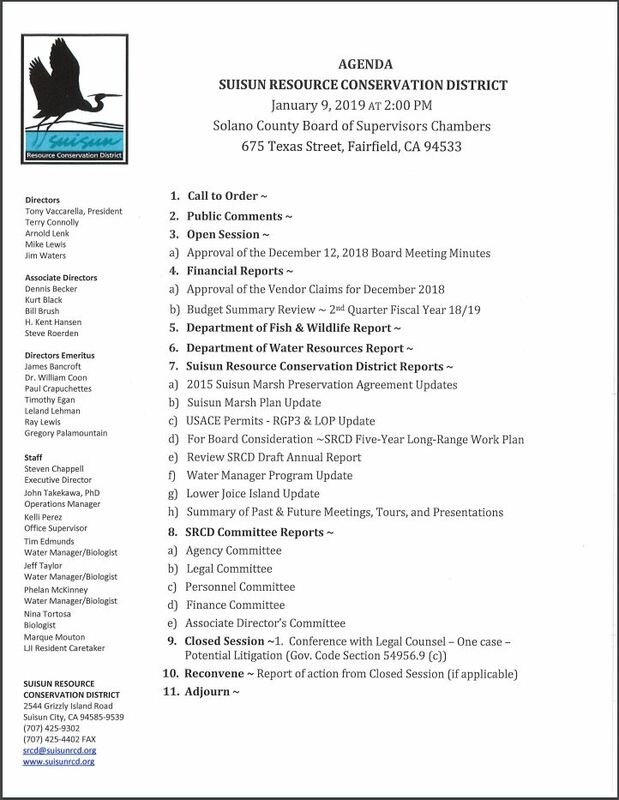 On your behalf, SRCD has been working with the Delta Watermaster to develop an Alternative Compliance Plan for all Suisun Marsh diverters to opt in to by January 1, 2017. The diversion measurement method of staff gauge and floodable acreage will continue to meet regulatory requirements for the measurement of brackish water used to manage Suisun Marsh wetland habitats. If landowners choose not to opt-in to the SRCD’s Plan, then landowners can physically measure their own diversion and report directly to SWRCB or face fines and penalties under the new law.